For 22 years now, the Mission: Impossible franchise has distinguished itself among its peers in the action genre by crafting increasingly audacious setpieces that favor dazzling stunt work above computer-generated effects. From the jaw-dropping Burj Khalifa sequence in Ghost Protocol, during which our hero Ethan Hunt (Tom Cruise) scales the largest building in the world, to the opening of Rogue Nation that depicts Hunt hanging off the side of a cargo plane during takeoff, these stunts all revolve around the intense dedication of its main star. That dedication is in full effect for Fallout, the sixth entry in the ever-impressive action series that features at least one or two sequences destined to become new favorites for fans and newcomers alike. Taking place 2 years after 2015’s Rogue Nation, Fallout rejoins Hunt with his IMF (Impossible Mission Force) teammates Luther (Ving Rhames) and Benji (Simon Pegg) as they attempt to intercept three plutonium cores but are foiled by a shadowy group codenamed The Apostles. Upon hearing of the botched mission, CIA director Erica Sloane (Angela Bassett) directs one of her agents named Walker (Henry Cavill) to monitor Hunt and his team as they work to recover the stolen material. As the plotline progresses, characters from previous films including Ilsa Faust (Rebecca Ferguson), Solomon Lane (Sean Harris) and others that are best left un-spoiled, are woven into the narrative. As things become more convoluted and the inevitable double-crossing begins, it’s probably best not to get hung up on the specifics of the plot and instead, just take in the often breath-taking sights and sounds that this film has to offer. Two scenes in particular, including a HALO (high altitude, low opening) jump above the Grand Palais in Paris and an extended aerial helicopter chase that features Cruise actually piloting the aircraft, will no doubt leave audiences speechless. 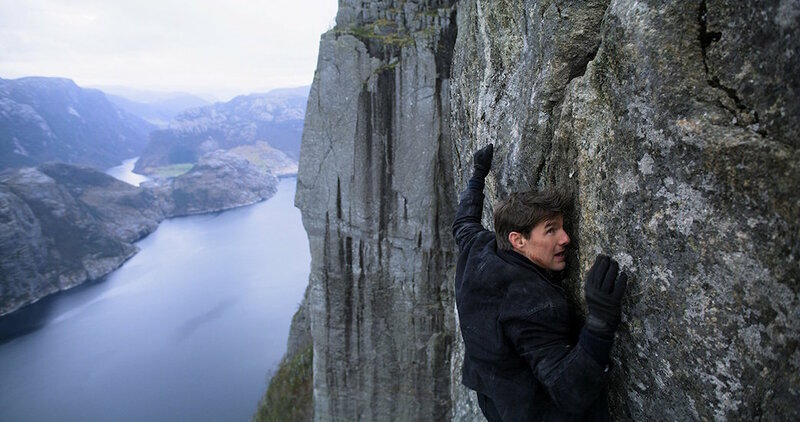 More and more films are being released in IMAX these days, often unnecessarily, but Mission: Impossible remains one of the only tentpole series to truly make the most of all the format has to offer. Fallout is unique to the franchise in at least two ways: it is the first time that the same director (in this case, Christopher McQuarrie) has directed back-to-back films in the series and it also boasts the shortest gap in production time between two films (3 years, while past sequels have taken 4-6 years to develop.) Unfortunately, both aspects seemingly contribute to my main criticisms of this entry, which is that it suffers in comparison by the high bar McQuarrie set for himself in the series-best Rogue Nation and it’s hamstrung by an under-developed script that would have benefited from a revision or two. The screenplay is rarely the centerpiece of any M:I film (most action films, really) but absence of fun character moments and memorably one-liners drags the film below a few of its predecessors. Still, this film succeeds on the strength of its visceral action sequences and it cannot be understated just how much these films benefit from the insane commitment of Tom Cruise. At 56 years old, he’s attempting stunts that action stars half his age wouldn’t give a moment’s consideration. In the instance of this film, he’s even suffering the consequences of those choices, evidenced by an ankle break that he suffered while jumping across rooftops in a high-speed foot chase. It’s difficult to know just how many more of these films Cruise has left in him, especially considering that he could potentially be in his 60s for the next entry, but if Fallout does end up being the concluding chapter in the Cruise era of Mission: Impossible franchise, it would be a fitting high note for an exceptional series.